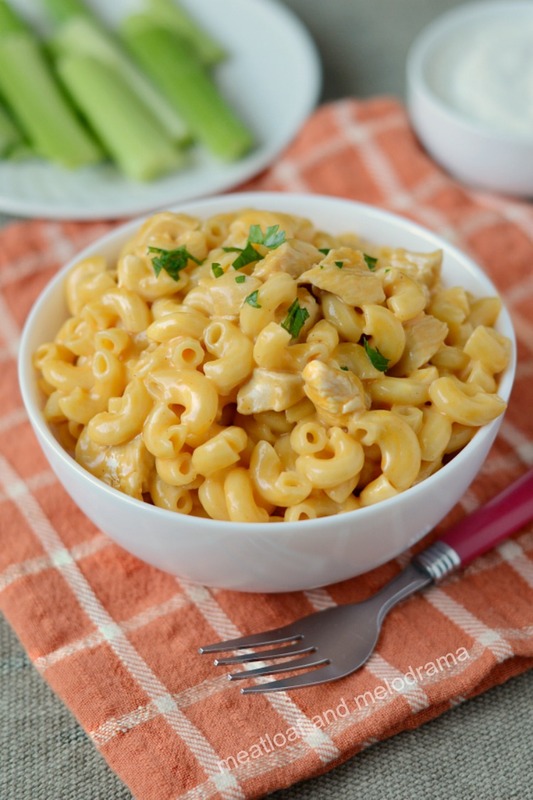 Instant Pot Buffalo Chicken Mac and Cheese is creamy, cheesy and a little spicy. It’s an easy dinner recipe perfect for game day and fall potlucks! It always amazes me when I hear people say Instant Pot recipes are bland. Seriously?! 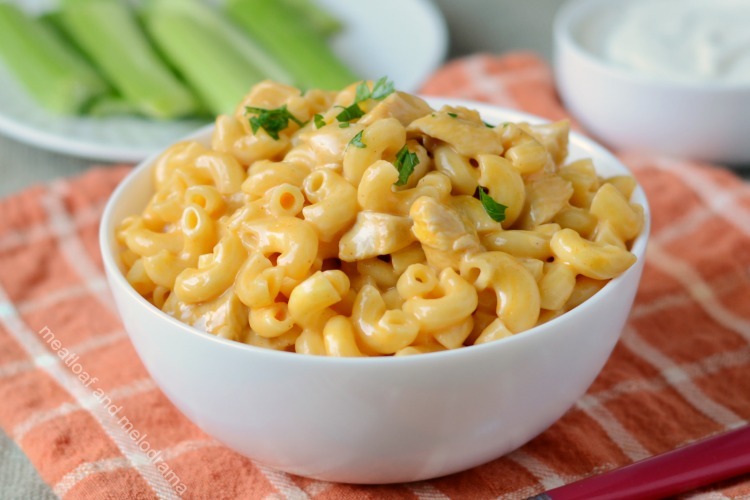 Friends, this Instant Pot mac and cheese recipe is packed with flavor! As much as I love my traditional creamy mac and cheese recipe and my usual creamy Instant Pot mac and cheese recipe, I may just love this Buffalo mac and cheese even more. Why? Well, I pretty much love any recipe with Buffalo sauce, and it really does take the usual homemade macaroni and cheese to the next level. I’m on a roll with the Buffalo recipes lately, but hey — it’s almost fall, y’all! 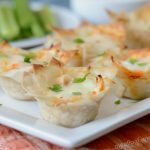 Last week, I shared an easy Buffalo chicken dip recipe and a way to use up leftovers with Buffalo chicken wonton cups. So, Instant Pot Buffalo mac and cheese was next on the list! The great thing about Buffalo chicken mac and cheese is that you can control the heat level by adjusting the amount of Buffalo sauce. 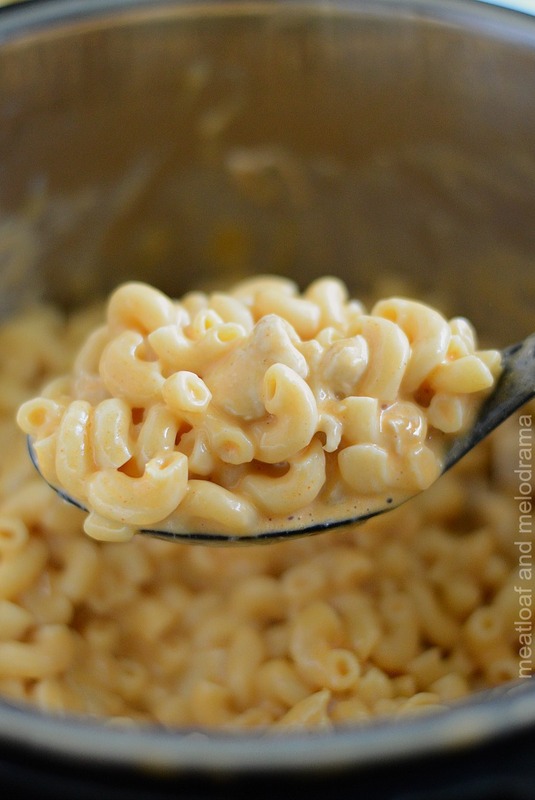 And, you can turn this into a creamy easy baked mac and cheese recipe if you want! 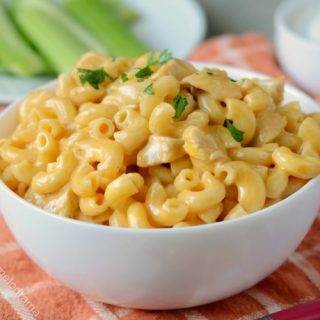 To make Buffalo chicken mac and cheese in the pressure cooker, you cut up some chicken and cook it in the Instant Pot until it’s no longer pink. Normally, I would use olive oil or vegetable oil here, but since we’re channeling all things Buffalo, I used butter, instead. Then, you add a little Buffalo sauce, like Franks. Next, add the macaroni, water and more butter. Then, pressure cook it! 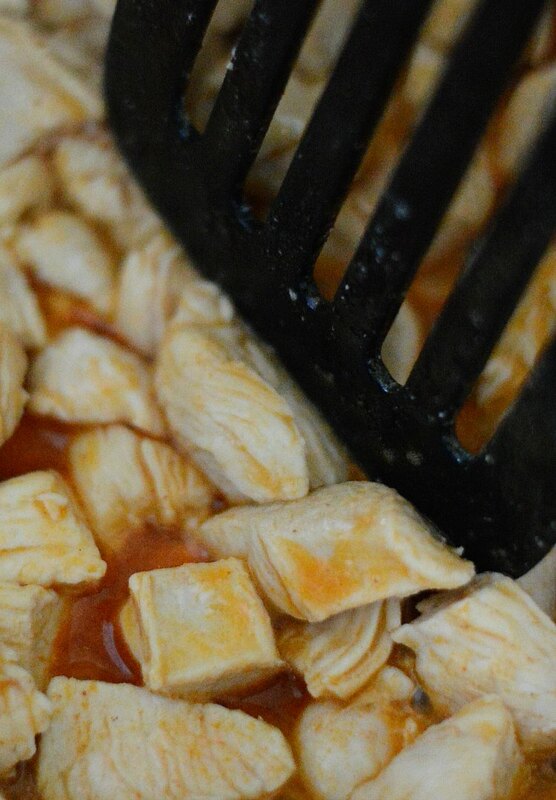 After the chicken and pasta cook, add a little more Buffalo sauce, cheese and cream, and stir it all up. If you want to make Buffalo chicken ranch pasta, you can use ranch dressing instead of the cream. 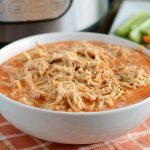 Instant Pot Buffalo chicken pasta is perfect for game day and fall potlucks — or whenever you’re craving some creamy, cheesy, Buffalo mac and cheese! 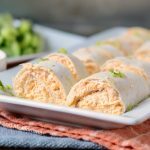 Looking for more Instant Pot Buffalo Chicken recipes? Recipe was made in 6-quart Instant Pot electric pressure cooker, but same amounts and time can be used for the 8 quart. For Buffalo Ranch flavor, use Ranch dressing instead of the heavy cream. 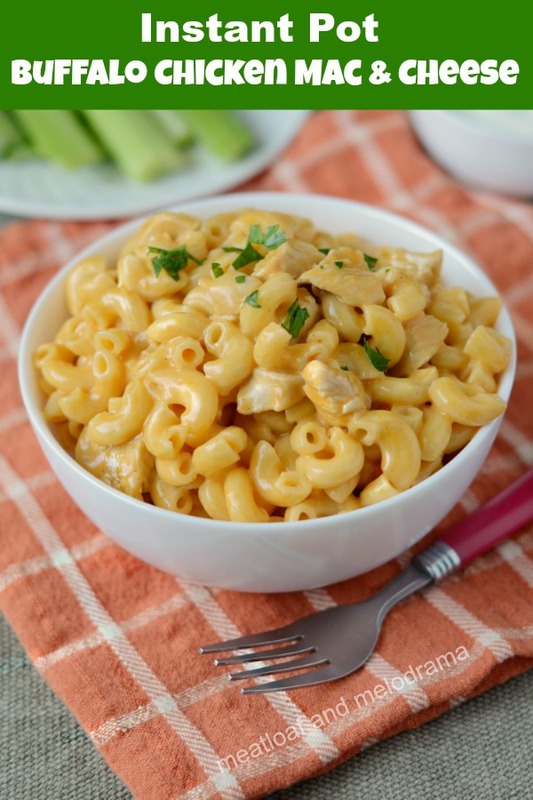 I hope you enjoy this easy Instant Pot Buffalo Chicken Mac and Cheese recipe as much as we do! 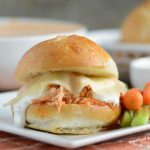 Love that creamy cheesy buffalo sauce! Loving this kicked up mac and cheese! So so yummy! I’m craving mac and cheese now! I wish I had a giant bowl of this right now. I love how creamy and cheesy it comes out. I’ve got to try this tasty recipe soon! This will quickly become a new favorite for my kids! We love the Buffalo flavor and this looks delicious! Hope you are having a good week and thanks so much for sharing with us at Full Plate Thursday! I loved this, the only thing I did was add a jalapeno. It was to die for! Thanks — so glad you liked it! I need to try adding your version next time! How long should it pressure cook if doubling the recipe?